Thomas Hampson in a clinch. Photo by Cory Weaver. 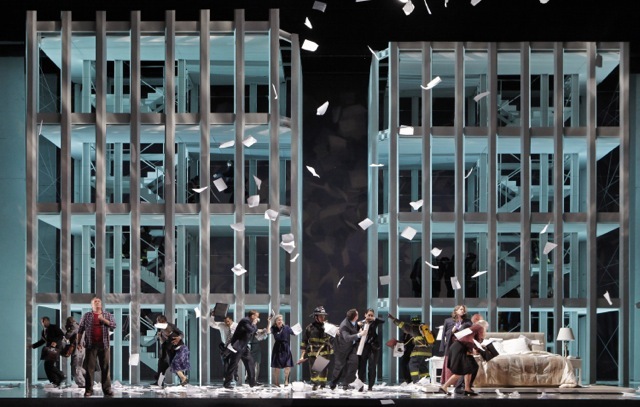 Can a ‘9/11 opera’ stand on its own as a work of art? “Heart of a Soldier” is a mighty effort to do the impossible. The San Francisco Opera commission has been automatically — and logically — dubbed the “9/11 opera,” but the team creating it did its best to focus on characters against the background of the destruction of the World Trade Center, instead of producing a musical documentary/homage for the event. What mitigates against distilling history into drama are the circumstances. Saturday’s world premiere took place on the eve of the event’s tenth anniversary, with 24/7 coverage all around us; the performance opened with the singing of the National Anthem while a gigantic image of Old Glory filled the curtain; ROTC students in uniform handed out the programs. 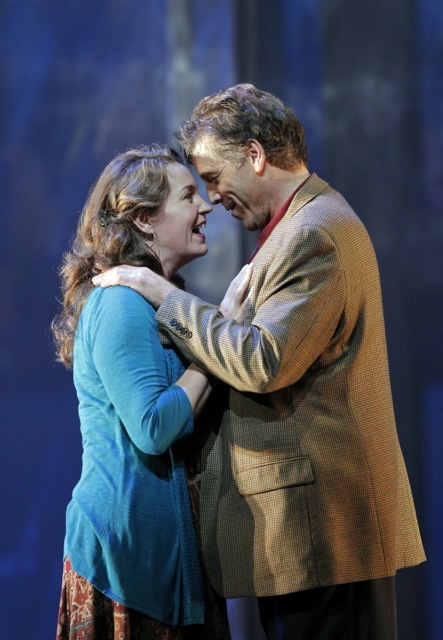 Rick Rescorla (Thomas Hampson) and Susan Rescorla (Melody Moore). Photo by Cory Weaver. Among General Manager David Gockley’s numerous “CNN opera” commissions, not one comes this close to being realized in a setting of a photographs, rather than paintings. It’s all too fresh, too real, too close. 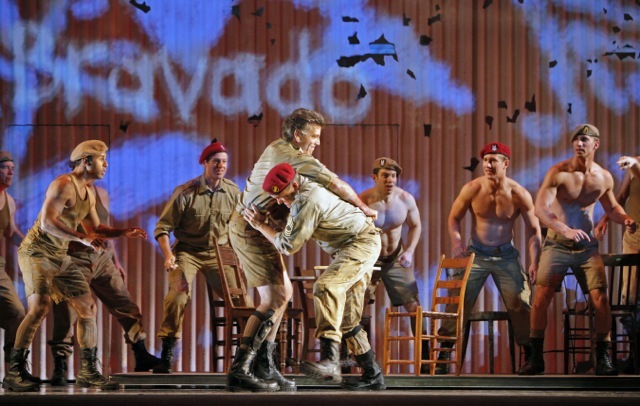 That aside – if reality can be ignored – the work is among the best of contemporary operas. Christopher Theofanidis’ music is tonal, accessible, with the harmonic beauty of a Korngold soundtrack. Donna Di Novelli’s libretto about the true story of Rick Rescorla is excellent, especially in the second-act romantic encounter between the two main characters in their 50s. The SFO Orchestra, under Patrick Summers’ direction played the rich score of large gestures with certainty; Francesca Zambello’s stage direction and Peter J. Davison’s sets are outstanding. There is a huge cast, including many Merola and Adler singers and alumni, and they were mostly successful in being heard over the orchestra’s storms. Among outstanding performances: Nadine Sierra (Juliet, Barbara), Henry Phipps as Rescorla’s 10-year-old self, and Mohannad Mchallah, called the Imam, but actually portraying a muezzin, calling to prayer from a minaret. The opera’s structure is surprising. The first act — tracing Rescorla’s life from his native Cornwall, staging area for D Day to Rhodesia to Vietnam — is relentlessly driving, hectic, music and drama saturated to a fault. The second act is quiet, with a different pace and feeling, even providing some laughs. Then the end comes, and it is done in a way that’s genuinely dramatic, without missteps. The collapse of the towers is handled by lights and a storm of falling paper, the music is eerie, free of bombast, with great impact. Here, and in several other places — acting against the numbing “action” of the first act — Gockley’s response to the challenge of realizing an opera for still-unhealed wounds rings true. That, at least, was the goal. World Trade Center disaster. Photo by Cory Weaver.